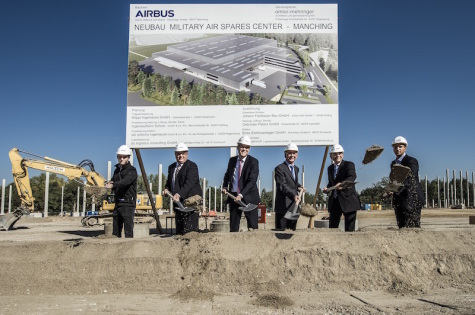 MANCHING, Germany --- Airbus Defence and Space is investing around € 60 million into a new logistics centre for spare parts of military aircraft (Military Air Spares Centre – MASC) at Manching to the north of Munich. In the presence of the authorities, an official groundbreaking ceremony has marked the start of construction works. The logistics centre will accommodate all spare parts and operating supplies that are necessary for producing and maintaining military aircraft. In total, it will be possible to stockpile up to 100,000 different parts. The state-of the art storage techniques will be process-optimised to supply each aircraft programme more efficiently and robustly. The centre’s capacity already takes into account possible future requirements like a German Tornado Replacement by additional Eurofighter aircraft and a new European Future Combat Air System (FCAS).